Dewpoint Average must be at 55°F or higher for 3 days in a row to offically start the Monsoon Season!! THE 2018 MONSOON SEASON HAS BEGAN AT PEPPERRIDGE! This means that the season began on July 6th.!! Pepper Ridge Dewpoint averages over the last 6 days. This is 3rd day in row with lows above 88°F and Highs at or near 110°F and little relief in the way of thunderstorms. now reaching 119 days with no measureable rain currently the 3rd longest such streak!! Sky Harbor received 0.56 inches of rain with wind gust of 71 mph!!! and ended their 119 day dry streak with no measurable rain!! Hear in the North Valley we received 1.02 inches about 0.75 inches of that fell in 30 minutes!! and winds gusts up to 37 mph!! North Mesa saw about 1 inch, Encanto Area 1.25 inches and the North Valley 1.02 inches from this powerful storm. The early wave of Thunderstorms primary hit Glendale and parts of Phoenix with up to 1.00 inch of rain near Metrocenter. in about 30 Minutes. Moderate rain from Thundershowers continue until about Midnight totaling 1.18 inches for day. A total of 2.20 inches rain has fallen in the last 3 days compared to 1.43 inches for the first six months of the year!! 1.50 inches around Wickenburg, 1.10 inches in Carefree and 2 to 2.50 inches in the Mountains Northwest of Lake Pleasant. causing major power outages and widespread wind damage. Peak observed winds gusts were 74 mph at the Phoenix/Deer Valley airport and Goodyear airport, though widespread values of 40-60 mph were common. Winds peaked here at Pepperridge at 30 mph sustained and a peak gust of 50 mph. NWS storm spotters and local media reported many trees down, primarily concentrated from north Phoenix to Goodyear. the heaviest rain fell across the extreme north valley and extreme east Mesa where about 1.00 inches were observed. 0.98 inches in North Scottsdale at Pima & Jomax, 0.43 inches in Cavecreek, 0.79 inches in Anthem and 0.75 inches in Wittman. Outside the valley the big winners were 1.30 inches at the North end of Lake Pleasant and 1.85 inches at Bartlet Lake. Pepperridge totaled 2.55 inches which is +1.44 inches above normal, the 3rd wettest July on record and the wettest July since 2005!! The average temperature at Pepperridge for July was 93.1°F the average high was 104.7°F and the average low was 81.1°F. above normal. Sky Harbor's average high was 107.5°F +1.4°F above normal and average low 85.5°F +2.0°F above normal. causing low visiblity and strong gusty winds up to 60 mph measured at Chandler and Goodyear Airports and a 54 mph gust at Sky Harbor Airport. far Southwest and West Valley areas. 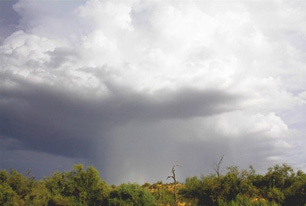 Reports of several structures damaged or destroyed were received in the Rainbow Valley area, and specifically in the Estrella Mountain Ranch community where a strong wet microburst occured (Pictured Left). 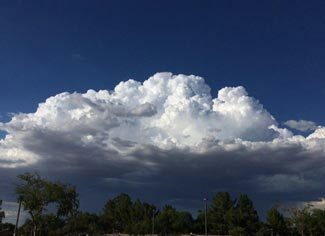 Additional thunderstorms formed as the storm cluster moved north primarly over the far west valley near Surprise which dropped heavy rain and hail. There was also thunderstorm wind damage with several trees down reported in Surprise. Heavy rainfall amounts include 1.73 inches in Rainbow valley near Waterman wash, 0.63 inches in Buckeye, 0.91 inches at Luke Airforce Base, 0.94 inches at Lake Pleasant North, 1.30 inches in Maricopa and 1.38 in Surprise. Other amounts in west valley averaged about 0.33 inches and Sky Harbor received 0.05 inches. Being a primary West Valley storm Phoenix proper and the East Valley saw little if any rain. Here at Pepperridge North Valley we had gusty winds and dust and a mere Trace of precipitation was measured. dropping between 0.50 and 1.50 inches with the heaviest in North Scottsdale and Fountain Hills. 1.22 inches fell on Camelback Mtn and nearly 2 inches fell in the Mc Dowell Mountains with 1.89 inches!! 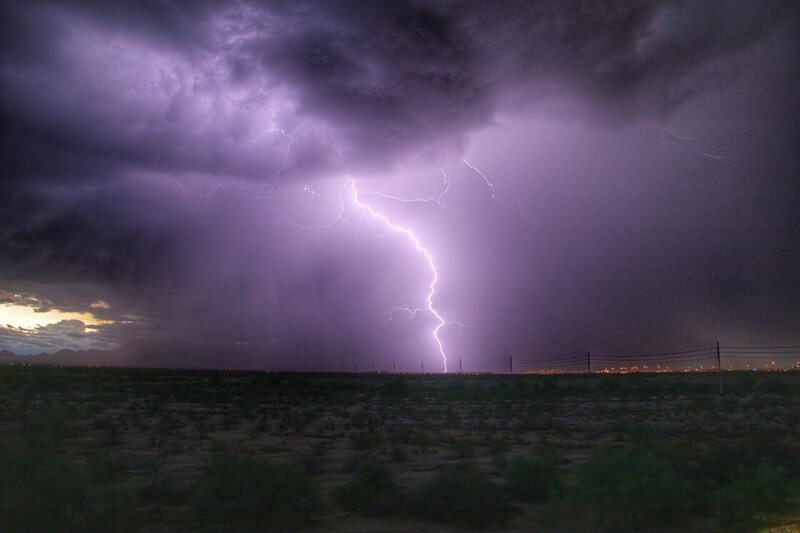 Last night's storm Primary hit East Mesa and Gilbert with between 0.25 inches and about 0.83 inches. and nothing but wind and dust from Tuesday night's storm, so August is off to a slow start so far at Pepper Ridge North Valley!! On Tuesday Sky Harbor had 0.08 inches of rain, tonight they received additional 0.08 inches and measured a 64 mph wind gust!! dropping heavy rain from Lake Pleasant to Surprise in amounts ranging from 0.10 inches to 0.87 inches near Surprise. 0.11 inches which actually occured after Midnight, compared to Tempe a few miles away getting 2.25 inches. In fact there was a couple of isolated spots in Tempe that unofficially received just over 3.50 inches!! fallen in three days of very active strong storms which have drench parts of the valley. rainfall amounts ranging from 0.50 inches to 1.25 inches. by Midnight and temperature has plunged to 69 degrees!! total to 0.37 inches as more on and off showers lasted till around 4am. Fountain Hills, Scottsdale, Tempe and the East valley where between 2 1/2 to 3 1/2 inches of rain has fallen in the last 3 days!! Heavy rain again fell in parts of Scottsdale, Tempe, Gilbert and Chandler, another area of heavy rain hit the Northwest Valley. measured between 0.50 inches to 0.75 inches. The other heavy pocket of rain was Northwest of Sun City with 1.89 inches. of rain fell and here in North valley 30 to 40 mph winds occured and 0.02 inches of rain fell here at Pepperridge North Valley!! gauge near Fountain Hills measured 0.83 inches and about 1.10 inches fell in mountains above New River. in two big storms in July. This means this active season ranks 3rd as of this date for rainfall Jun 15th through Aug 14th*. out through Sept 30th!! For comparison Sky Harbor the official guage for Phoenix has seen 1.50 inches so far this season. Even with this active season both locations remain about 2 inches below normal for the year thanks to a very dry winter. flow aloft as storms moved west to east. These storms were good rainfall producers with the light steering winds. Some areas saw very heavy rain especially near North Mountain Park where up to 1.77 inches of rain fell. Strong gusty winds were reported along with flooded washes and street flooding in the Sunnyslope area. The far North Valley near Cavecreek also received just over 1.25 of rain and Chandler saw 1.50 inches of rain. Here at Pepperridge 0.62 inches of rain fell in just under 30 minutes with winds gusting to 37 mph. Temperatures fell from uppper 90s to the middle 70s in a little under 30 minutes during the storm. August 24th - More Isolated Thunderstroms formed over parts of the the central city and the East Valley this evening. 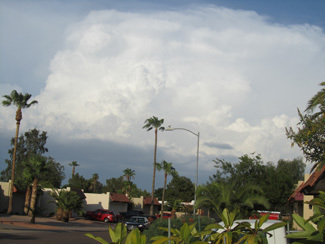 One Isolated thunderstorm formed directly over the Sky Harbor dropping 0.42 inches bringing their August total to 1.50 inches. with up to 1.00 of rain. The north valley received little if any rain including no measurable rain at Pepperridge. Isolated areas near Wittman and the most East Valley were way above normal with 3 1/2 inches for the month!! with intense downburst winds, heavy rain, hail and dropped a little over 1 inch of rain in under one hour. drop 0.19 inches on Sky Harbor in early morning hours of Sept 3rd. No measurable rain fell in the North valley!! September 19th - It was a cloudy and showery day thanks to a transitional rainfall event the Monsoon's last Ha-rah. 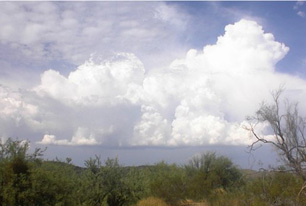 strato-cumulus form rain showers over much of central Arizona more commonly seen with a winter season type event. These showers resulted in 0.18 inches of rain at Pepperridge and the first measurable rain of September in North Phoenix. in Pinal and Pima counties with rainfall amounts between 0.50 inches and 1.00+ inches of rain in the heaviest storms. where between 0.50 to 1.25 inches of rain fell during the afternoon hours and this led to locialized flash flooding. and up to 0.98 inches in the Gila Bend Mountains. Harquhala Mountain had 0.79 inches!! Meanwhile in Greater Phoenix area light showers fell in evening dropping between a Trace to about 0.20 inches. Officially Sky Harbor received 0.07 inches and Pepperridge North Valley received 0.06 inches!! For the Month of September Pepperridge North Valley received 0.24 inches which is (0.64) inches below normal. The Monsoon Season total for Pepperidge North Valley was 3.99 inches which is +0.56 inches for the season!! For September Sky Harbor received 0.43 inches which is (0.21) inches below normal. 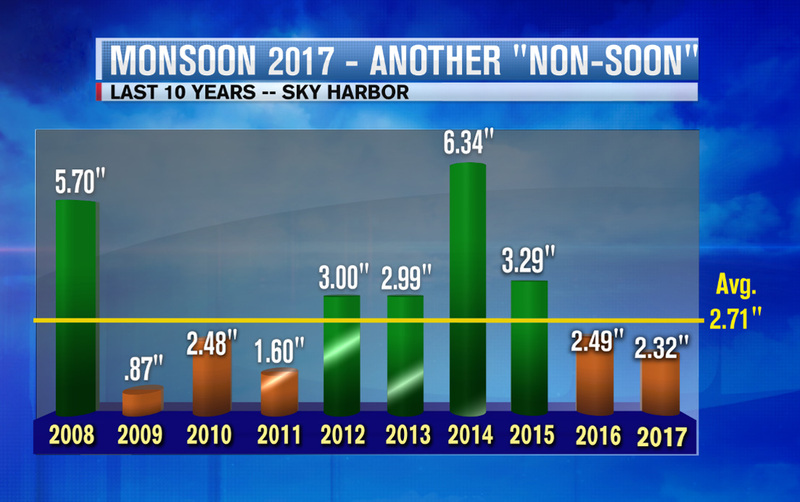 The Monsoon Season total for Sky Harbor was 2.63 inches which (0.08) inches below normal!! THE 2017 MONSOON SEASON HAS BEGAN AT PEPPERRIDGE! If that low holds through midnight tonight it will set a new All-time record high minimum for this station. The current All-time record high minimium is 91.5°F set on July 16th, 2010. Under all that intense heat it was the first real active day in mountains with Prescott receiving 1 inch of rain. Those storms held to together as a convective complex and moved west all the way to the California border. Even Lake Havasu City and Needles, Ca had thunderstorms and received measurable rain. but the temperature fell to 94.8°F just before midnight but it is still the new All-time highest minimum!! July 16th - Finally after teasing us the last 2 days wind strong winds and dust storms the Monsoon delivers. as compared to last couple days where rain mainly fell in the extreme Northwest part of the valley near Lake Pleasant. Here at Pepperidge 0.90 inches fell between 10pm and Midnight ending a 67 day dry streak. So far it appears the heaviest rain fell in west valley near Luke Airforce base with 1 1/2 inches to nearly 2 inches!! bringing meaningful rain to the Pepperridge where we recorded 0.37 inches of rain. July 23rd & 24th - Monsoon starts with a big tease last night bringing wind and sprinkles to the North Valley. Round two this morning brings another 1.00 inches to the Far East Valley on top of the 1.5 inches they saw last night. Leaving 2.50 to 2.75 inches in places like Apache Junction, East Mesa, Queen Creek and even Buckeye. The North Valley finally gets some moderate rain this morning for a little over an quarter inch with 0.28 inches. Luke Air-force base with winds of up to 80 mph and up to 1.25 inches of rain!! Another cell formed nearly directly overhead in the North valley as a brief heavy thunderstorm hit just after 5pm. Nearly 1/3 inch of rain fell in about 20 minutes!! The daily total was 0.32 inches, with 30 mph wind gusts at Pepperridge this cell moved southwesterly and dropped up to .60 inches on the Phoenix Mtn preserve near 7th st and Thunderbird roads. Meanwhile Sky Harbor received only 0.02 inches!! July 31st - Isolated thunderstorms hit the extreme North Valley today dropping between 0.50 inches and 1.00 just east of Anthem and west of Cavecreek. (pictured to the right) This storm barely moved south of the Carefree Hwy. Outflow winds peaked at 29mph were recorded here at Pepperridge but no rain fell. This left us with 2.01 inches for July which is +0.95 inches above normal and the first above normal precipitation in July since 2011!!. The average temperature at Pepperridge for July was 92.3°F the average high was 103.9°F and the average low was 80.8°F. 4.25 inches in Apache Junction & Queen Creek to areas with less than 0.50 inches such as at Jomax road and I-17!! Parts of North Phoenix received 1.00 inch of rain and the storm drop 0.51 inches at Pepperridge in about 25 minutes. 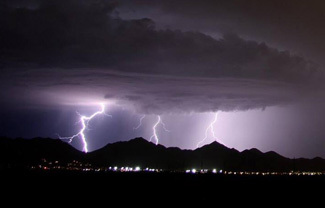 The heaviest and stongest thunderstorms occured in south central Phoenix near the Phoenx Zoo and Tempe. With many of these areas seeing high winds, downed trees, street flooding and over 1.75 inches of rain. Sky Harbor received 0.92 inches of rain and a landspout weak Tornado was detected a few miles south of the airport. The East Valley also had thunderstorms and received between 0.50 inches and 1.35 inches from these storms!! slow moving storms moving from west to east kept hitting the same areas for several hours from 9:30pm last night to 6 am this morning. 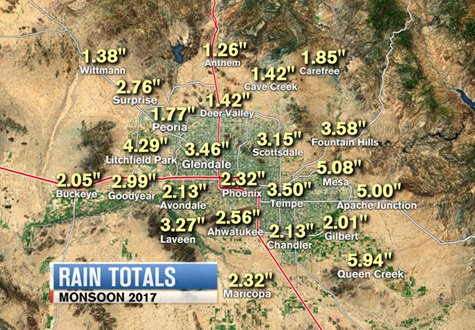 Areas in the southwest valley saw up to 2 inches in Glendale as well as extreme south Phoenix. In the east valley mainly south of the US 60 saw many areas with over an 1 inch of rain. Meanwhile in the Northeast valley there was lots of wind and thunder and lightning in the distance for hours. and the storm total was a disappointing 0.18 inches, Sky Harbor officially measured 0.36 inches. Aug 23rd - After another 10 days of unusually dry August weather thunderstorms returned to the valley. A dust storm rolled into the Southeast valley but it produced only light showers but the outflow winds led to new thunderstorms. Around 9:30pm thunderstorms formed in the north valley. Areas near Moon Valley saw up to 0.50 inches. The northwest valley also saw around 0.50 inches in northern Peoria. Here at Pepperridge 0.27 inches of rain fell from this thunderstorm. Aug 31st - Unusually dry weather prevailed for the rest of the month with thunderstorms being restricted to the High country. For the season so far Pepperridge has received 2.97 inches which +0.47 inches of the season to date normal of 2.50 inches. Sky Harbor has received 2.32 inches which is +0.25 of the season to date normal of 2.07 inches!! Sept 30th - Unusually dry weather prevailed for most of the month September with thunderstorms being restricted to the High country. In fact the second half of the month was relatively dry even for the high Country as Westerlies prevailed most of the month. about 0.50 inches in the extreme eastern part of the valley near Queen Creek and Apache Junction. final 37 days of the Monsoon season with no measurable rain. Pepperridge's last measurable rainfall was 0.01 inches on Aug 24th!! With no measurable rain recorded in September was (0.93) inches below normal & tied 2001 for driest September on record!! For the season Pepperridge received 2.97 inches which is (0.46) inches below the normal 3.43 inches and the 10th driest on record. with the last official measurable rainfall of 0.06 inches back on Aug 23rd!! Monsoon 2017- was characterized by two contrasts the active wet period from mid July to mid August. these seasonal transitional events usually send rich moisture into the state and produce September thunderstorm outbreaks. an intense downpour or seeing no rain at all. 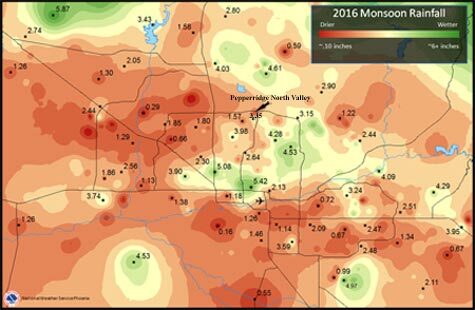 (The map below left shows the rainfall this summer across the valley). The big winners in valley were East Mesa at Power and Mc Dowell with 5.08 inches and Queen Creek with 5.94 inches!! The greatest 24 hour total was 0.95 inches on July 16th, August 3rd received the 2nd greatest with 0.51 inches!! only 7 days with with at least 0.10 inches or more with four of them in July. Only 2 days received more than 0.50 inches. Suprisingly there were only 4 days of measurable rain that occured after July 31st and all of days were in August!! their greatest 24 hr total occured on Aug 3rd with 0.92 inches!! Their second greatest 24hr total was on Jul 16th with 0.38 inches!! greater than 0.50 inches. There were only 5 days of measurable rain that ocurred after July 31st all of them also in August!! Tucson with 8.57 inches or +2.49 inches above normal but 6.80 inches fell in 2 weeks in July their wettest on record!! Nogales 9.30 inches, Safford 7.04 inches, Sierra Vista 6.18 inches and Willcox 6.67 inches!! 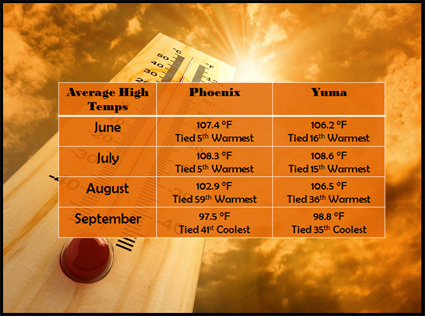 when Phoenix hit a high of 119°F degrees, which tied for the 4th hottest temperature EVER recorded in Phoenix. In the North Valley Pepperridge recorded 117°F degrees that same day tieing the hottest EVER for our location. This was the just start of 10 day period of 110°F+ heat around the valley one of the hottest periods in Phoenix history. all of those days occurred during the Monsoon. By comparsion here in North valley there were 10 days at 110°F or better. with it hitting well over 100°F the for first two weeks with the heat officially peaking with a high of 110°F on Sept 13th setting a new daily record!! in the last 50 yrs during the month of September!! on Sept 25th it was also 55.4°F on Sept 21st, 2004!! This front all but assured the end of the Monsoon scouring out the remaining Monsoon moisture with it's cool dry air. 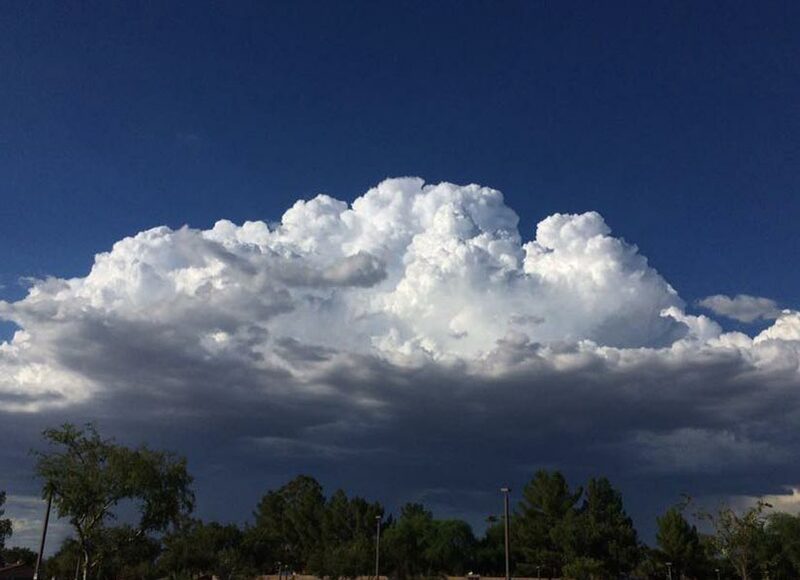 Thunderstorm activity was mainly limited to the mountains all month and for the final month of the Monsoon only a Trace of rain was recorded at both Sky Harbor and Pepperridge!! 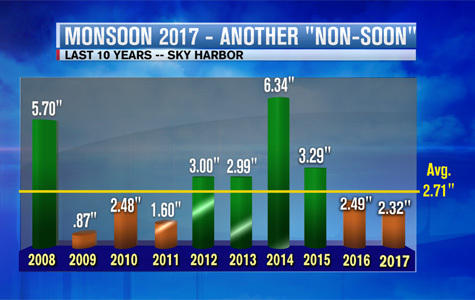 The chart to above right shows the last 10 years of monsoon rain totals for Sky Harbor. THE 2016 MONSOON SEASON HAS BEGAN AT PEPPERRIDGE! This means that the season began on June 26th. when 0.01 inches fell from weak isolated thundershowers that effected parts of the valley. where 1.50 inches fell in extreme north Mesa at the granite reef dam on the Salt River. So for the Month we saw the 2nd hottest July on record with 94.6°F, Jul 2009 still holds the record hottest month ever with 94.9°F. 2000 and 2009. Sky Harbor even beat us and received 0.89 inches for the month which is closer to the normal of 1.12 inches. just northwest of downtown with 2.91 inches fallimg near Grand Canyon University and 2.50 inches in Encanto area. Heavy rain also fell near Anthem & New River with 1.50 inches, Old Town Scottsdale also received 1.50 inches as did Falcon Field. Sky Harbor recorded 0.15 inches and here at Pepperidge we saw 0.18 inches as the storm primarly missed us again. For the season Pepperridge has only received 0.39 inches more than a 1.25 inches below normal at this point in the season. in just 30 minutes causing major street flooding across parts of the north valley and northeast Scottsdale. and a few points to the north in the mountains near Pinnacle Peak in North Scottsdale had up to 2.50 inches!!! This single storm brought us back to closer to normal with 1.94 inches for the season so far. Aug 20th - Another evening of Strong Gusty Winds and Isolated Thundershowers in the North Valley. This evenings Thunderstorm produced a peak gust of 30 mph with substained winds of 22mph and it was followed by a little rain. and the season total to 2.06 inches, the bulk of that falling in the Aug 5th storm which produced 1.55 inches!!! 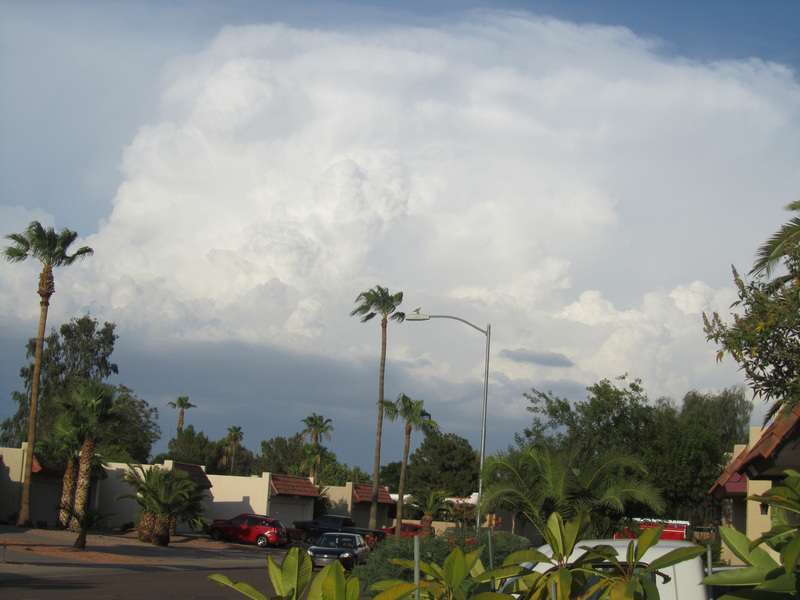 Aug 22nd - Isolated thunderstorms effected parts of the Phoenix Metro and Maricopa County this afternoon. One Area of heavy rain was near Wickenburg where about 0.75 inches fell and about 0.50 inches fell in Peoria. Another isolated thunderstorm that produced heavy rain was just 5 miles Southwest of here where between a 0.50 inches to nearly an 1.00 inch fell this was in the area around Phoenix North Mountain Park and 7th Street and Thunderbird. Meanwhile here at Pepperridge we received another meager amount as just 0.04 inches fell to put this in perspective so far this summer we have had 10 days of measureable rain but only THREE of those days have exceeded 0.10 inches!!! Sky Harbor to about 0.60 inches in Northern Peoria. Pepperridge received 0.27 inches bringing the monthly total to 2.16 inches and the season total to 2.37 inches. This storm also produced the coolest overnight low since Jun 15th the low this morning was a nice cool 68.8°F the last time we fell below 70°F the low that morning was 66.8°F!! Aug 25th - 26th - Thunderstorm activity continued across mainly the North and Northwest parts of the valley. heavy rain fell in the mountains North of the Valley including some areas near Crown King receiving over 2 inches. 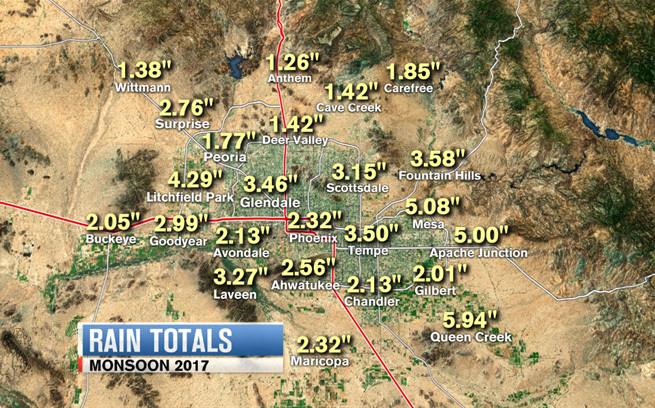 In Phoenix a few areas mainly in Southwest valley near Buckeye saw up to 0.50 inches of rain. Here at Pepperridge only 0.17 inches fell in early morning which was a big disappointment. Sept 19th - 20th - Moisture from a second tropical system Payne began effecting the state this combined with a cutoff Low. This low pressure moved up near Yuma bringing moderate rain to Southwestern Arizona and Northwestern Arizona. Rainfall amonts varied between 0.25 inches along the Colorado river basin up to 1.50 inches near Prescott. Here in Phoenix clouds and humid air brang sprinkles and up to 0.10 inches of rain and Pepperridge recorded a trace. to 0.75 inches fell in the area, the heaviest rains were from afternoon thunderstorms in Camelback and Arcadia areas. Here in the north valley at Pepperridge we received a decent amount with 0.40 inches of rain. While the mountains and Southeast Arizona saw an 1 inch plus over the period the deserts have seen 0.25 inches or less. below normal. The final Monsoon Total was 3.35 inches at Pepperridge which is slightly above the season normal of 3.22 inches. Sky Harbor the official tally for Phoenix saw 2.49 inches which (0.22) inches below normal of 2.71 inches. Flagstaff with 11.41 inches, Kingman with 4.27 inches and Tucson with 7.39 inches saw well above normal season totals. The big "winners" here were in the Central Phoenix area along I-17, SR-51 and Loop 202 corridor north into Scottsdale. Pepperridge saw 3.35 inches of rain which 0.13 above normal. The 9th wettest Monsoon. and is the driest monsoon since 2011. Imperial, CA received just .16 inches, much of that in late September. This is also the driest monsoon for Imperial since 2009 when the area saw just a trace. Lastly Blythe, CA saw .54 inches. with measurable rain and another six with a trace. The wettest day in Yuma was July 25th with 0.37 inches of rain. and only 4 days exceded 0.25 inches the wettest day was August 5th with 1.55 inches. July was the driest ever with only 0.05 inches of rain all which fell on July 29th!!! of those days occurred during the Monsoon. By comparsion here in North valley there were 9 days at 110°F or better. THE 2015 MONSOON SEASON HAS BEGAN AT PEPPERRIDGE! This means that the season began on June 25th. July 18th & 19th - Arizona and Southern California began to feel effects of Hurricane Dolores. The storm curved toward the north-northeast off the coast of Baja California and began to weaken. She was downgraded to a tropical storm on Friday July 17th and degenerated into a post-tropical low-pressure on July 18th. Her last reported location on Saturday evening was about 300 miles west of the Baja California coast. the combination of this low pressure and the monsoonal flow helped pull the rich tropical moisture into the Desert Southwest. but the unusually strong low pressure off Calif pulled most the rich tropical moisture into Southern California. caused the collapse of a eastbound bridge on Interstate 10 near the Desert Center on Sunday July 19th!!! This caused major flooding in some neighborhoods and along washes near the Hassayampa River. Only July 2000 and 2009 saw less tied for the driest on record at 0.13 inches!! Normally May and Jun combined average is just 0.13 inches!!! moved through the valley today one in the morning and another this evening but little rain fell here. Aug 25th - NONsoon 2015 continues to disappoint another dust storm & Thunderstorms approached from the south only to fizzle out. For the entire Monsoon Season only 0.48 inches has fallen only 2009 was drier at this point with 0.47 inches. We will see the 3rd Driest August, Driest Monsoon thru Aug 31st and hottest August on record!!! Which means near the main ASU campus both storms delivered a total 1.75 inches. Meanwhile the North Valley saw sprinkles to light showers from both Thursday's and Saturday's storms. This leaves August precipitation total at a mere 0.18 inches and the entire Monsoon season at only 0.54 inches. Only a wind and a lightning show here in the North Valley as the storm passed to Southeast about 5-10 miles away. The 3rd Driest August on Record!! and for the Monsoon only 0.54 inches has fallen making it the driest on record thru Aug 31st!! The previously driest to this point was 2009's 0.67 inches. Records date back to 1997 at this station. This average temperature also ties July 2003 for the third hottest month ever!! forcing the Monsoon High to remained south of it's normal 4 corners position!!! This includes Pepperridge North Valley where 0.35 inches of rain fell mainly between 10pm and 11pm. With this precipitation 2015 is now only the 2nd driest Monsoon at 1.13 inches leaving 2009's 0.69 inches the driest ever!! Sept 22nd - The forcasted Major Phoenix rain event of widespread rain event on Monday and Tuesday never materialized. As the bulk of the moisture shifted East hitting parts of Southeastern Arizona with 2 to 3 inches of rain. and East Mesa receiving 1 to nearly 2 inches of rain that caused flash flooding in isolated areas. Most everyone else in the valley saw lite rain or none at all from the tropical storm system. (36% of Normal) and leaves 2015 as the second driest Monsoon todate, with only 8 days left to go in the season. Meanwhile offically at sky harbor they faired much better with 3.29 inches compared to a normal of 2.71 inches. THE 2014 MONSOON SEASON HAS BEGAN AT PEPPERRIDGE! This means that the season began on July 3rd. This was also the night of the first big dust storm "Haboob". However no measurable rain has fallen yet in the North Valley. However outside the city heavy rain falls in Maricopa and other areas. Heavy rain and winds with 1.03 inches here 0.54 inches of that fell between 11:10pm and 11:20 pm. This storm ended the 90 day streak without measurable rain the 6th longest in station history. After 90 days of no measurable rain 2.11 inches have fallen since July 26th!!! but a breif downpour of 0.50 inches hit around 9:30pm leaving this station with 0.65 inches for the day. This was due to influence of low pressure off California and a strong Monsoonal Flow. This led to widespread flooding in New River and Black Canyon City and Along I-17. This storm drop another 0.96 inches between 11:45am and 12:15pm another evening storm brought only lite rain here. 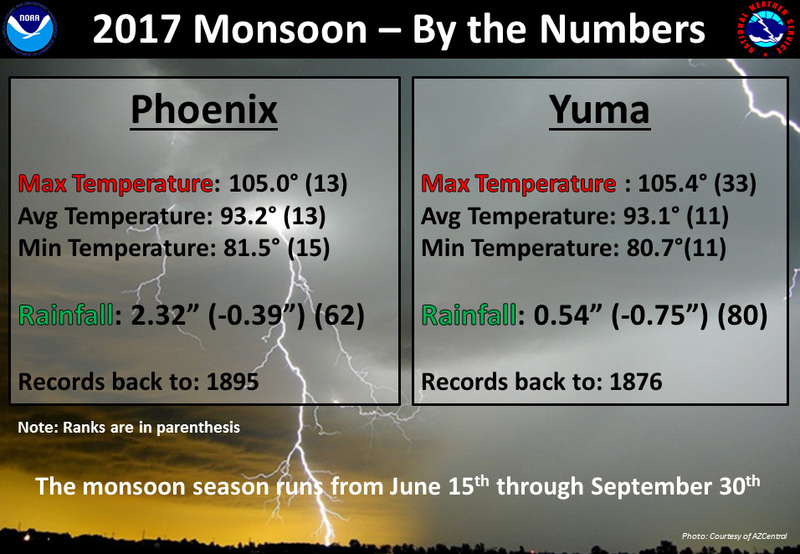 Monsoon Rainfall is statistically measured from June 15th thru Sept 30th!! THE 2013 MONSOON SEASON HAS BEGAN AT PEPPERRIDGE! criteria of dewpoint*, by the newer set date system the season began on June 15th!! The month ended with 2.22 inches of rain the second wetest September on Record!! THE 2012 MONSOON SEASON HAS BEGAN AT PEPPERRIDGE! through early next week. So the season is here but little storm impact is expected for now. Here in the North Valley debris clouds bring a Whopping 0.02 Inches of rain. Season total is now at 0.24 inches as the dry start to the Monsoon continues!!! Jul 21st - So far the first 3 weeks of the Monsoon has been a dud in the North Valley. which is right now the driest year on record in 16 years of data keeping thru July 21st!!! Futher to north in New River they got up to 1 - 3/4 inches which is more than our yearly total!!! The drought continues as 2012 is now the 2nd driest year on record thru July 31st!! than normal and other areas very little... for an active season 2012 has been a big disappointment so far. Aug 14th - The monsoon tries to return after 2 weeks relentless heat but was unimpressive again!! The Monsoon Season total is only 0.86 inches less than 60% of normal so far and it stands as the 2nd driest on record. Aug 21st - Finally Monsoon 2012 produces a storm that delivers meaningfull rain in the North Valley!! Bringing the season total to 1.36 inches now the 3rd driest on record!!! Aug 23rd - Very Early Morning severe thunderstorm brings a impressive light show and heavy rain and localized flooding. Pepperridge received 0.52 inches from the storm that brang 1.5+ inches in localized valley locations. 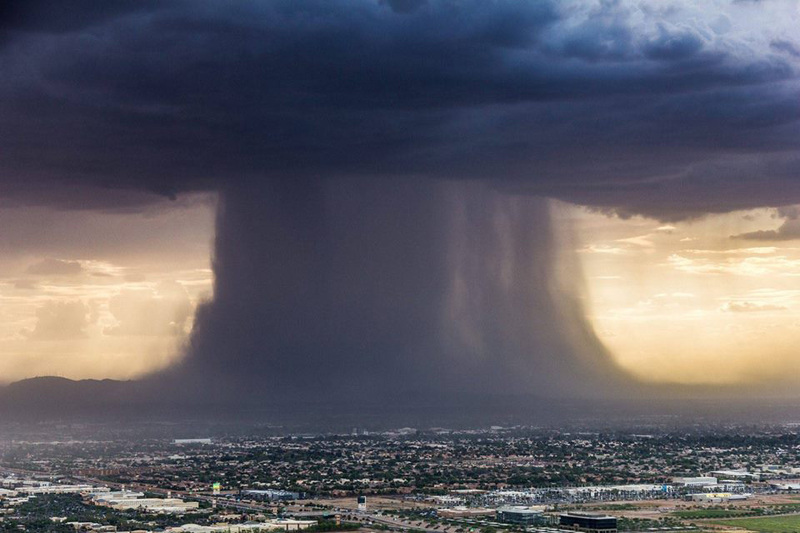 Sky Harbor received daily rainfall record 0.80 incbes a impressive storm nearly valley wide. Sept 9th - Another uneventful storm for the North Phoenix Valley with only 0.14 inches of rain from morning Thundershowers. However East Mesa and Apache Junction got hit again with up to 2 1/2 inches of rain and street flooding. Even Sky Harbor picked up 0.51 inches while Pepperridge finally manage to hit the 2 inch mark for the season. 2012 remains the 7th Driest Monsoon on Record with only 65% of normal precipitation for the Monsoon. with a series of decent Thunderstorms over the last two days. Sept 2006 holds the record for wettest Monsoon month with a the record breaking 5.24 inches!! THE 2011 MONSOON SEASON HAS BEGAN AT PEPPERRIDGE! This tied with 2000 for the sixth longest rainless streak at this station. The 3 Day total is 0.62 inches meaning this is best start to the season since 2008!! July 11th - Overnight thundershowers and thunderstorms produce the largest rain event so far. Moderate to heavy rain totaled 0.48 inches between 3am to 6am bringing July's rainfall to 1.10 inches. With this storm more rain has fallen so far in Monsoon 2011 than during the entire 2009 Season!! meaning the best start to Monsoon Season since 2008 continues!! with 2010s season total which means one more storm should make this the wetest Monsoon since 2008!! this storm dropped 0.44 inches between 9:30pm and 11:30pm at Pepperridge with periods of brief heavy rain. Aug 3rd - A surprise thunderstorm poped up this evening bringing welcoming rain after a excessively hot day. Tonight's strong storm delivered heavy rain with 0.50 inches between 8:30pm and 8:40pm!! The temperature fell from 98°F to 77°F during the same period with winds gusting to 32mph!! Total rainfall from this storm was 0.75 inches which brings the season total to 3.11 inches. Aug 13th - Overnight Thundershowers brang some brief Heavy Rain totalling 0.24 inches!! Bringing the August total to 0.99 inches and the season total 3.35 inches - 6th Wettest Overall. brief moderately heavy rain fell amounting to only 0.13 inches a disappointing dusty evening!! Sept 30th - Monsoon 2011 ended with a disappointing final 6 weeks with only 0.09 inches of rain falling. 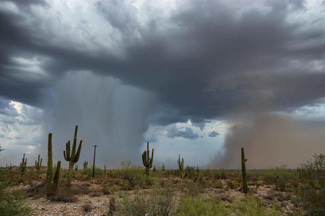 The season ended with 3.57 inches rain making Monsoon 2011 the 6th wettest overall. THE 2010 MONSOON SEASON HAS BEGAN AT PEPPERRIDGE! The season began on June 15th based on the calendar date criteria!!! THE 2010 MONSOON SEASON IS ALMOST HERE AT PEPPERRIDGE! criteria by the newer set date system the season began on June 15th!! This is the second longest rainless streak at this station. Chandler , South and Central Phoenix, Glendale, Peoria and Sun City. Winds even damaged a section of the roof at University of Phoenix Stadium. Here at Pepperridge we received only a glancing blow from this storm. a daily record at Sky Harbor with 1.33 inches, so for parts of valley July ended fairly wet with up to 2 1/4 inches. But at Pepperridge it has been a fairly dry month and Monsoon 2010 has been a NONSOON so far. This storm moves Monsoon 2010 into 2nd place for the Driest Monsoon on record!! Aug 24th - Another promising storm goes bust here at Pepperridge with brief heavy rain but only 0.08 inches total! These were the strongest so far of this Monsoon with substained winds of 29 mph & peak gust 40 mph at 4:32 pm!! Aug 28th - A unusually strong front for late summer influences the season as westerlies begin to drive the moisture out. However a brief Heavy thunderstorm effected the area with 0.19 inches of rain bringing the month to 0.86 inches. Aug 31st - As August closes Monsoon 2010 remains one of the driest in 3rd place overall for driest Monsoon. The August rainfall was 0.86 inches which was (0.42 inches) below the normal 1.28 inches. The month closed out dry as westeries again disrupted the monsoon because of the lingering effects of El Nino. Tropical Storm Georgette. Otherwise the Monsoon was almost non existant in September. THE 2009 MONSOON SEASON HAS BEGAN AT PEPPERRIDGE! Driest Monsoon on record with only 0.69 inches, it has been a disappointing Summer! THE 2008 MONSOON SEASON HAS BEGAN AT PEPPERRIDGE! The 2008 Monsoon Has Began at Pepper Ridge North Valley!!! HOWEVER based on the new Method of preset dates the Monsoon began on June 15th!! the Monsoon began three days ago on July 3rd. Last years season began on July 8th. On July 11th and 12th with a peak Wind Gust of 25 Mph at 8pm on July 11th. On Aug 7th with a peak Wind Gust of 37 Mph at 9pm. On Aug 25th with a peak Wind Gust of 26 Mph at 7:55pm. Aug 28th - 4th Decent Storm of Monsoon 2008 produces 0.21 inches and a peak Wind Gust of 37 Mph at 9pm. The Brunt of the storm hit S.E. of this location in Tempe/Mesa and Central Phoenix. A 75 Mph Gust was recorded at Sky Harbor Severe ThunderStorm details.